Adopting a homeless dog will actually save TWO dogs’ lives! You are providing a forever home for your new family member (dog #1 saved) and we now have a foster family that opens up to receive a new dog (dog #2 saved) that we otherwise would have had to turn away. If you are considering a new dog in your life, the best reason to adopt is that you will be saving a life. Millions of loving and wonderful companion dogs are euthanized every year at dog shelters simply because there are not enough homes who want them and not enough room or resources at shelters to care for them. By adopting a dog you will also decrease the demand for puppies at pet stores. Many people think that you can’t get a loving, healthy dog from a rescue. Nothing could be further from the truth! Pet stores buy their puppies from breeders that operate puppy mills. Dogs that are bred at puppy mills are often the product of in-breeding and have genetic-based health issues that will tax your heart and wallet with veterinary bills and a shorter life-span for your dog. When you adopt one of our dachshunds, you enjoy the added savings that our dogs are fully vetted and spayed or neutered. Another wonderful reason to adopt is that not every family has the time or patience for the demands of life with a new puppy. Like any baby, puppies need a good deal of nurturing, training, and care that a full-grown dachshund won't need. An adopted adult dog will be ready for a new home and will thank you for the rest of their life. If you ARE looking for a puppy, we have puppies on a very regular basis! Please contact our Adoption Director and ask what our puppy status is. Our puppies may not always be listed on our Availables page if they are too young to be placed. We encourage you to peruse our list of available dachshunds who are waiting so patiently for the right family to find them. By adopting, you will save a dog’s life and help in the ongoing battle to put puppy mills out of business. Q: What are the requirements for Adopting? A: First, you will need to fill out an Adoption Application. • We will check your references. • Someone will come to your home and do a home visit. • You must have a securely fenced area for outdoor business and exercise. Invisible fencing may not be substituted for a wood/metal/composite fence. Q: I am interested in Adopting one of your dogs, how do I start the Adoption process? A: Fill out an application! It is first come, first served and we go by when the actual application is received. Please visit our Adoption Application page. Q: I am looking for a particular gender, coat, color, size, or age. A: We can help match you up to the perfect new family member! Even if we do not have what you are looking for at this time, we highly recommend that you fill out an application and go through the approval process. Once you are pre-approved, you will be the first one notified when we do get a dog that fits your interest. Q: What if it doesnt work out? A: NDR will always take back any dog that does not work out. There is a clause in the final contract that you will sign that guarantees you will return the dog if things dont work out. A week later...a month later...or a year later; we will take them back. 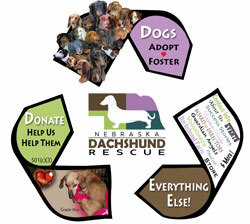 What kind of ADOPTIVE FAMILY does Nebraska Dachshund Rescue look for? • Feed a healthy diet to maintain an ideal weight. • Exercise them. Train them. Play with them. • Keep them as an inside pet and will not ever be left outside unattended. Doggie doors can only be used if the family is home. • Preferably a fenced yard, but we will review each application on a case-by-case basis. "Yes, I'd like to speak with someone about ADOPTION"